Most Overwatch characters will let you shoot people in one very specific way. 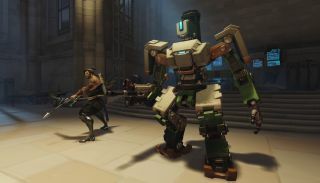 Bastion—the subject of the above game footage—can shoot people across three different forms: robot, gun turret or tank. The Reconfigure skill lets Bastion transform between mobile assault unit and stationary gun turret. While mobile, he carries a submachine gun. When switching to turret duty, he instead packs a gattling gun and forward-facing shield. His Ultimate offers a few seconds of tank fun, complete with long-range cannon. Head to our Overwatch tag page to see more game footage. Overwatch is due to enter beta testing this autumn.